Workers’ Compensation Hearing Loss In Maryland – What to do? A couple of years ago a man in Connecticut was awarded a $1.5 million compensation by a court of law after he filed a personal injury claim for the loss of hearing. 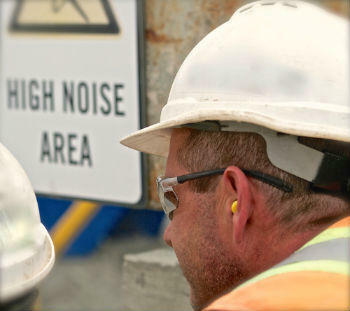 A study by the Occupational Safety and Health Administration reveals that nearly 30 million people in the USA are exposed to dangerous noise levels at work every year. So if you are among those people, and you have suffered for it, then it is time to act and get the help of a workers’ compensation lawyer in Maryland. The loss of hearing can be a valid work injury claim in Maryland. What you need to know is that medically speaking, there are two types of hearing loss: conductive and sensorineural. The conductive hearing loss occurs when a part of your ear is unable to transmit the sound waves to the eardrum. The sensorineural type happens when the inner ear, the central nerve or the sound-processing part of the brain is damaged. A valid workers’ compensation claim in Maryland needs to be backed up by an “accidental personal injury arising out of and in the course of employment”. It is important to remember that because not all injuries that happen at work fall under this category. When it comes to the loss of hearing, if you want to obtain a work injury cash settlement in MD, you have to prove that this disability is work-related. Employers may try to break down your claim by pointing to advanced age or saying that your injury was caused by you listening to loud music. Any professional work injury attorney in Annapolis will tell you that it is easier to win a work injury cash settlement in MD if your job environment is noisy and requires you to wear protective gear. But even if this is not the case, you can still have a chance of winning the lawsuit if you work with an experienced attorney. The usual work injury reporting procedure in MD does not necessarily apply to the loss of hearing. Of course, if you have been hurt at work, and you have lost your hearing as a result of the injuries, the reporting procedure is the same. But if your hearing has been lost gradually because of the noisy environment, it may be more difficult to prove the employer’s liability. You will need to have an audiogram and determine how much of your hearing is lost and also, that audiogram needs to be compared with others from your past. There are many elements to a workers’ compensation claim and the only one that can sort it out and help you build a powerful case is your lawyer. If you need the help of a workers’ compensation lawyer in Maryland, then you should give us a call. We have experience and know-how, and we can help you receive compensation for your injury. Call (443) 569-3950 at any time or send us an email at [email protected]. We offer you a free initial consultation and the possibility to get a professional option on your case.